Minor oral surgery is used for the surgical treatment of dental problems that involve the teeth, jaws, gums, lips or mouth, soft tissues in the oral cavity, and the neck area. This type of surgical treatment is used to address functional (and at times, the cosmetic) needs in the above-mentioned areas, which have been affected by injuries or diseases. Tooth Extractions – This type of minor oral surgery is done for teeth that have been damaged beyond repair, that no other dental treatment can save it (or improve its condition). A surgical tooth extraction can also be done in cases when the removal of a tooth (or several teeth) is needed as a preparation for an orthodontic treatment, so that the teeth can properly move into their desired position without overcrowding issues. Dental Implant Treatment – Dental implants are surgically embedded into the jaw bone to replace the form and function of missing natural teeth. Using a dental drill, the dentist will make a hole through the gums and the jaw bone; the resulting hole is where the implant will be embedded to form a secure base where the dental restoration will be attached to. Wisdom Teeth Removal – A wisdom tooth extraction is needed to remove a tooth that has not fully grown out from under the gum line, or is impacted. Problems with an impacted wisdom tooth include a great deal of pain, difficulties in cleaning the affected tooth, and improper tooth eruption especially when the tooth moves sideways and against surrounding teeth. 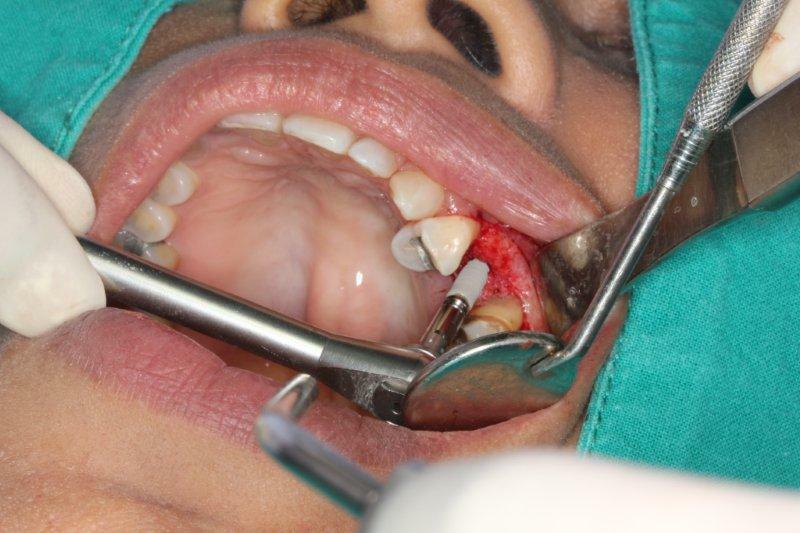 The surgical procedure will involve making an incision on the gums, to gain access to the impacted tooth. Endodontic Retreatment – Also called a repeat root canal treatment, an endodontic retreatment is done on a tooth that has already been treated previously with a root canal procedure. This minor oral surgery is needed in cases when the first root canal treatment has failed, and the former symptoms (infection, dental abscess, or pain) come back. TMJ Disorder Treatment – Minor oral surgery is needed for the treatment of TMJ (Temporomandibular Joint) disorders which cannot be improved with medications, exercise, splints, or physical therapy. The surgical procedure is done on the jaw area, just like in cases when a specific jaw joint has been found to be suffering from TMJ problem. Apicectomy – a surgical procedure that places a filling in the end of the tooth root and removes any infection from around the tip. The aim is to contain any bacteria that may be remaining within the canal system. Who Can Have Minor Oral Surgery? Minor oral surgery is recommended for those who need treatment for the following dental problems: impacted wisdom tooth, severely decayed or damaged teeth, infections in the tooth pulp and roots, missing teeth (for dental implant treatment ), a failed root canal treatment, and TMJ disorders. Minor oral surgeries offer huge benefits in cases when other treatments are not successful in addressing existing dental problems. A dental surgical procedure will provide pain relief, removal of infection, and overall long-lasting treatment results for dental concerns that no other means will be able to address.